There is a lot to consider when you get engaged and you start to look at diamond rings. We have put this guide together to help you through the process. So, you are thinking of getting engaged or have already popped the question? A really, really momentous and exciting time in your life that you will never forget. Now the big question is how to go about purchasing an engagement ring? It is such an important purchase and you really want to get it right. 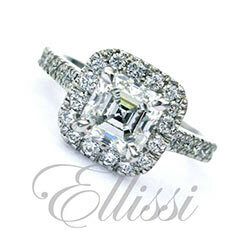 There are a few ways to do it – buy ready made off the shelf, order ready made online or go to a custom ring maker like us here at Ellissi. Buying off the shelf is great if you find what you like and the quality is good…sadly so much of what is on offer is mass produced and the quality really suffers as a result. Low grade diamonds look O.K. in the glittery lights of the shop…but when worn outside in normal daylight don’t look that great. Ordering a ring online can be a big problem if you don’t like what you get when you receive it in the post…it’s not like a pair of shoes that you can just give away if you don’t like them. Not all companies are that good when it comes to returns. We think that custom making is the best of all worlds for our clients. You get the ring design that you want. You get to choose a great diamond that suits your budget. And you get a superb quality ring at a fantastic price! Every ring is designed around the central gemstone, so choosing what shape diamond you like best is perhaps the easiest starting point. There are a lot of different cuts to choose from: round cut, princess cut, cushion, oval, emerald cut, asscher cut, marquise cut, radiant cut and variations such as square cushions, square radiants, and so on. One thing that you will discover as you begin your research about diamond rings, is that there is a lot to learn about diamonds! And there is a lot of misinformation out there on the net. Going to shops can be very confusing, as staff are often poorly trained and are not jewellers. The solution? Make an appointment to see Ian, and you will be relieved to get the facts in a down to earth, no pressure environment. After 36 years in the trade, he knows an awful lot about diamonds! You don’t always have to come in for an appointment. We have lots of clients from all over Australia and overseas. Most of whom we have never met. We can cover a lot via email with great information and photos to explain it all! When you come to our workshop, you’ll see immediately that you are not in some glamorous shop! Good job that our superb diamonds and diamond rings speak for themselves, as we don’t have any ritz or glitz to sell them! Jett is our resident dog. He comes to work with us every day as he is a rescue dog and is a bit needy. Like most dogs, he doesn’t like to be left home alone. Jett looks a bit like Mike Tyson, but in his nature is really more like Bambi. He has the gentlest of souls. He’ll probably sit at your feet while you are here and beg for a pat. But don’t worry if you are not keen on dogs! We understand completely. In fact we never used to be that enthusiastic about dogs either until we met Jett. Now we just want to breed staffies…but that’s another story! Good job that Jett loves walks as much as he loves pats. We’ll simply take him for a walk while you are here. During your appointment, you will learn a lot about diamonds and diamond rings. You will learn about GIA certification. You will discover that the 4 C’s really only cover the basics. From fluorescence to colour and clarity, there is a lot more to diamonds than meets the eye. top of their grade is what we spend a lot of our time doing. But it is time well spent, if you want the best you can get. You will see hundreds of ring designs of on our website, and no doubt you will have ideas drawn from other diamond rings you have seen elsewhere. The beauty of having your ring custom made, is that you can draw on different design elements that you like and together we can design a ring that you love that is unique to you! 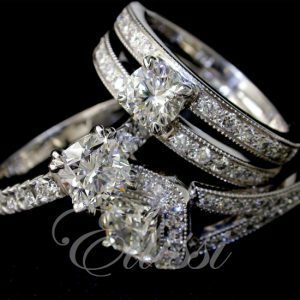 Once you are happy with the design, we can get started on making your engagement ring. A well made ring should not be rushed, and generally it will take us around three weeks to make a ring and have it valued. Time lines can vary depending on our workload at the time and the complexity of the ring. Let us know ifyou have a date that you need the ring by, as this will help us prioritise our work. All our diamond rings are independently valued by a member of the National Council of Jewellery Valuers. This gives you peace of mind that the diamond is as described in the GIA certificate. It is also is an independent assessment of the quality of the ring. Your insurance company will also require a copy of the valuation so that you can insure the ring. But if you really want, we can give you some tips on that too! Ellissi Jewellery is rated 5 stars by 36 customers.